This triple Limited Grand Prix weekend began as hundreds of explorers dived down into the plane of Ixalan! 731 players converged in Hong Kong today but only 245 will return tomorrow for six rounds of Ixalan Booster Draft. What were some of the highlights on Day 1? Pro Tour Ixalan was just around the corner (next Friday!) and it was safe to assume that teams have begun their discussions on how to conquer the format. What was interesting about the Sealed Deck environment was that opinions were quite polarised. Not everyone had the same take on how fast or how slow the format was and how to approach it. A player might call a certain card underwhelming while another player might end up playing with that card most of the time. 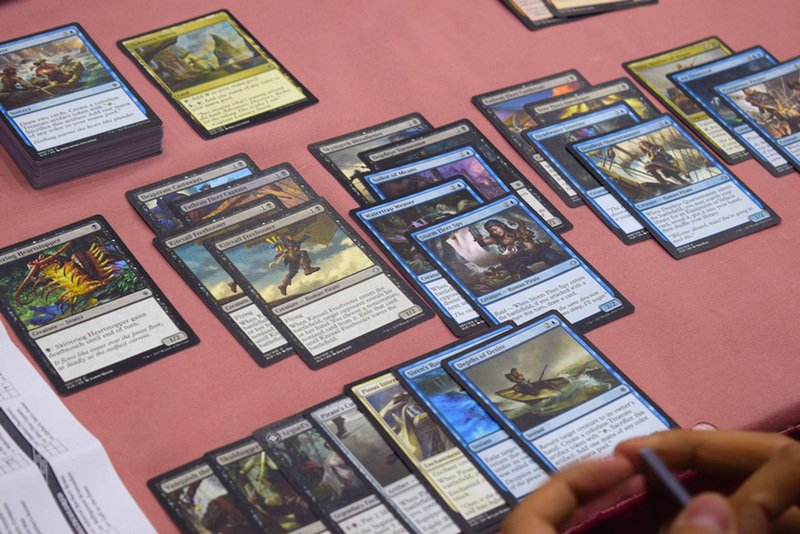 Let's peer into the minds of some players headed for Albuquerque and listen to what they have to say about certain cards. Which were the most underrated and overrated cards of the format? 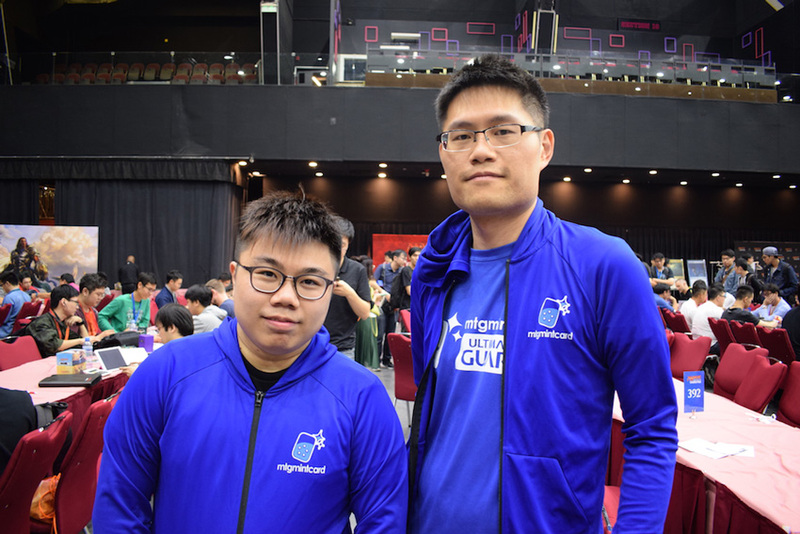 Let's kick off with two members of Musashi, the team who won the Pro Tour Team Series during the 2016 - 2017 season. 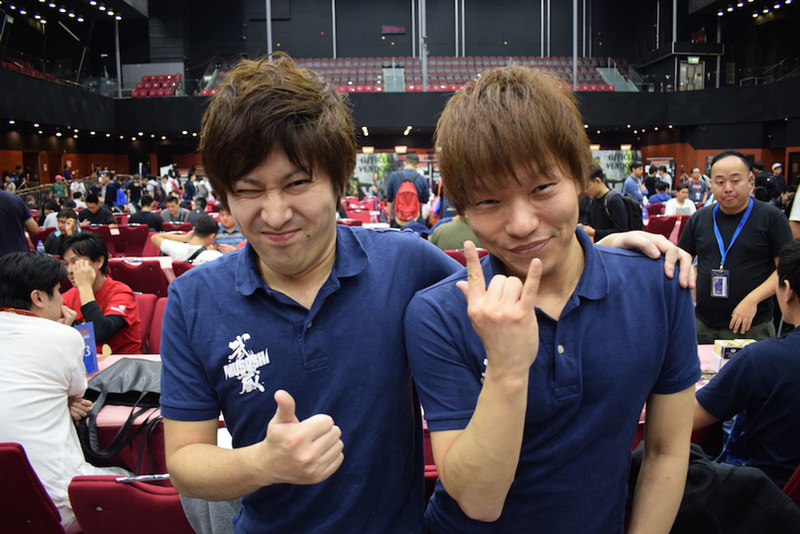 Three-time Grand Prix Champion Yuuki Ishikawa and two-time Grand Prix Champion Teruya Kakumae were happy to share. According to Ishikawa, "Elaborate Firecannon is underrated". He said that it was great when you mana flood in Sealed Deck and players were not playing it enough. As for the most overrated card, Ishikawa went with Vanquish the Weak. "It's a great card, but players overestimate how good it is. They think it's too good. For me, I think its just average because there are still a lot of big creatures in Sealed and there are also some auras such as One with the Wind, Mark of the Vampire, and Swashbuckling. If they successfully enchant their small creatures, you are stuck with a poor card." Kakumae cited Pirate's Cutlass as the most underrated card this weekend. 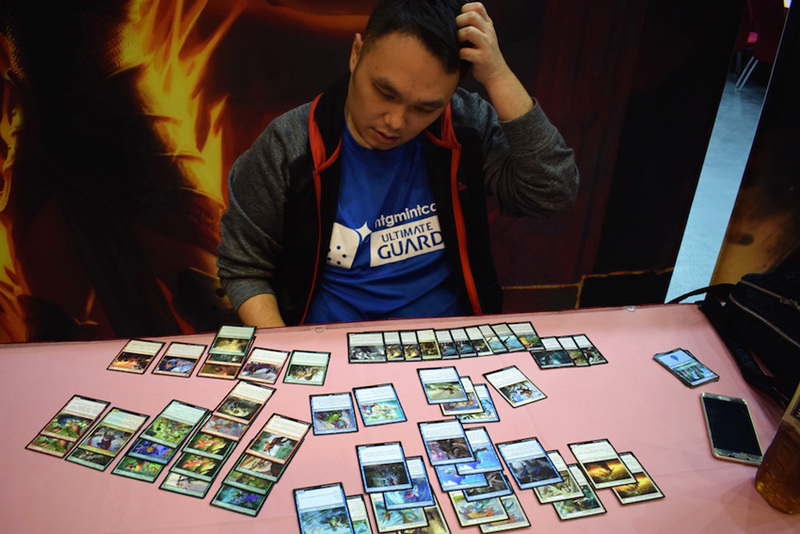 "I saw many players are leaving it in their sideboards. To me, I will always play it in Sealed because it is great. As for the overrated cards, I think anything more than 5 mana is not so good unless it is a bomb rare. 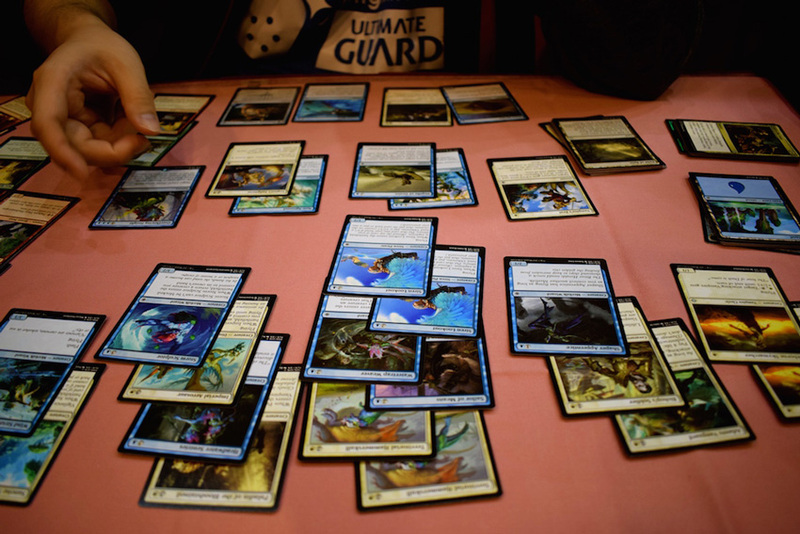 The format is fast and I think building a fast deck is the way to go." The exception is white, because there was plenty of life gain and Kakumae said that you will reach the late game more often. For instance, Shining Aerosaur is great! Moving on, we have two players from Team MTG Mint Card, who placed 3rd at the Pro Tour Team Series last season. Grand Prix Taipei 2014 Champion Huang Hao-Shan and Pro Tour Hour of Devastation Top 4 competitor Yam Wing Chun weighed in. Huang said that Crushing Canopy was the most underrated common in Sealed, while Pounce was the most overrated. "Most people think of Pounce as a removal spell but it is really quite situational. If you don't have enough big creatures in your deck, it is very difficult to use. On the other hand, I will main deck Crushing Canopy often. I believe every color has important targets. Blue and black have many fliers, and even Red-Green Dinosaurs will run Cobbled Wings. Popular white cards are Pious Interdiction and Ixalan's Binding (which some players even splash for), and also Shining Aerosaur. It also destroy the transform enchantments such as Vance's Blasting Cannons." Yam named Siren Lookout as the most overrated card. "The card doesn't do what you need it to do, sometimes you want a land but you end up with a 2/3 flier and vice-versa. Other times, you want a 2/3 flier but end up with a 1/2 body and fall behind on the board. It's decent but nothing amazing." As for their most underrated, Yam chose Paladin of the Bloodstained. "As a common, four power for four mana on two bodies is a good deal. It's almost up there with Territorial Hammerskull in terms of power level!" 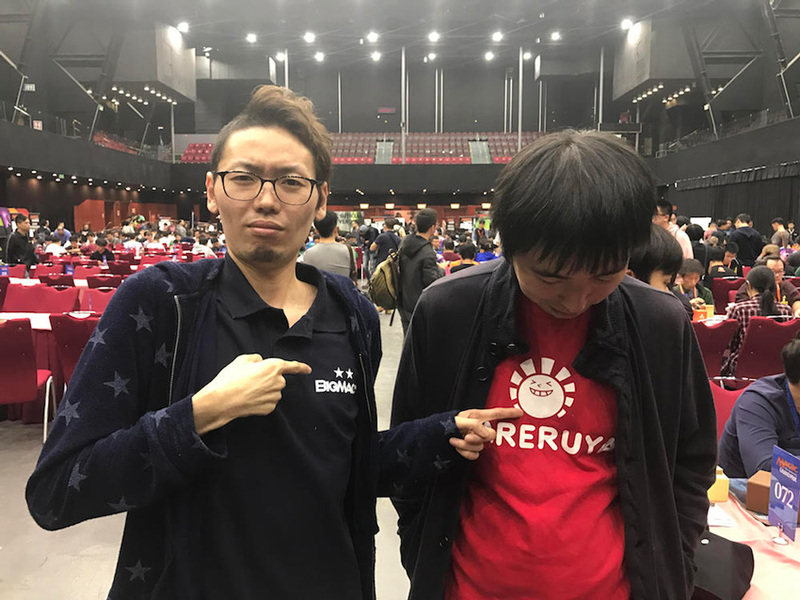 Pro Tour Hall-of-Famer Shuhei Nakamura and Pro Tour Battle for Zendikar Champion Kazuyuki Takimura had other opinions. Takimura said that Dire Fleet Interloper (and, by extension, other explore creatures) were very underrated in Sealed. "Explore is much better in Sealed than Booster Draft. Dire Fleet Interloper is more than great and not that many people are playing it. On the other hand, players play bounce spells such as Run Aground and Depths of Desire which are no good. This format is not so fast and players just need to cast that creature again. You don't gain much from the tempo." As for Nakamura, he felt that Cobbled Wings and Legion's Judgment were not being included in the main deck as often as they should be. "Cobbled Wings is good for pushing damage and during standstills. Legion's Judgment is good in Sealed because everyone has big creatures, unlike Booster Draft where up to 60% of the time it is a dead card. On the other hand, Slice in Twain was a card which he noticed numerous players main decking but he maintained that "Disenchant effects are bad". With that, we've learned a little more about how to approach Ixalan Sealed Deck. Perhaps there were different opinions at Grand Prix Phoenix and Grand Prix Liverpool? As the format continued to mature, perhaps we might garner a different understanding by the time we get to Grand Prix New Jersey and Grand Prix Singapore in December! The journey of discovery goes on! 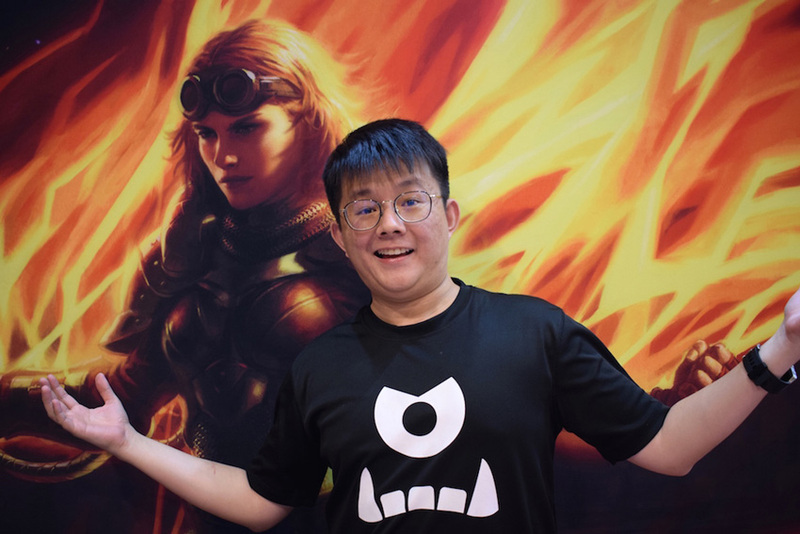 As one of the highest-ranked players in the room and also Hong Kong's most winningest player, we decided to check in with Lee Shi Tian for some insights on the format. However, within seconds of reviewing his card pool, Lee started shaking his head profusely. "My deck is all over the place. I'm also very low on spells. This could be bad." Quickly identifying his strongest core color - white in this case - he began by pairing it with black. Combined with Queen's Commission, Call to the Feast, and Anointed Deacon, White-Black Vampires looked neat with the support of 2 Duskborne Skymarcher, 2 Kitesail Freebooter, 2 Deadeye Tormentor, 2 Territorial Hammerskull, and Imperial Aerosaur. However, the deck lacked noncreature spells, having only Vampire's Zeal, Legion's Judgment, Skulduggery, and Mark of the Vampire. A nineteen-creature, four-spell deck isn't quite the norm, but it could work in certain situations. With Sealed Deck being a slower format, aggro decks may not always fall into place or be as fast as the decks from Booster Draft. If that was the case, players might gravitate towards playing a slower midrange or control deck with higher power level. Lee said that if his opponent was playing such a deck, it was where the discard spells would shine. "Adding Heartless Pillage and Duress, I have up to six discard effects. This is very efficient against control decks since they need both their land drops as well as their big spells. Token makers such as Queen's Commission, Call to the Feast, and Paladin of the Bloodstained are also well-positioned against spot removal." However, it was not a deck which Lee hoped to register as his main deck. He explained that Sealed Deck has an inherent metagame and there are a few archetypes which players tended towards. Since you can always sideboard out your main deck and change it into an entirely new deck for Games 2 and 3, he shared that having a secondary (or tertiary) deck was quite important. With that in mind, he began working on Red-Green Dinosaurs, a deck which he believed was great against White-Black Vampires. "Red's mana curve looks terrible. I have two two-drops and two six-drops, and nothing in between. My only good spells are Firecannon Blast, Unfriendly Fire, Sure Strike, and Vance's Blasting Cannons. Luckily, I can fill up the holes with some green dinosaurs, such as double Ravenous Daggertooth, Grazing Whiptail, and Raging Swordtooth." Lee went on to explain that Black-White Vampire decks usually have small-sized creatures and tokens. In a standstill, he could break the stalemate with a lethal Dinosaur Stampede to trample past everyone or grind out the game with Vance's Blasting Cannons. He also added that both his Sun-Crowned Hunters basically can't be chump blocked since you would still take damage thanks to its enrage ability. And of course, Raging Swordtooth was devastating against them. Despite already having two solid decks, Lee utilized the remainder of his time to build a third deck, White-Blue this time. "Sometimes, if your opponent is playing a fast deck and you might fall behind on the board. I'm just worried that I run into a truly aggressive deck, such as White-Red Dinosaurs or Blue-Green Merfolk. Just in case, I might want a White-Blue Control deck which gums up the board and wins with fliers." Sailer of Means and Headwater Sentries never looked so good, and Lee even went on to add that if he had Looming Altisaur in his card pool he would run it. As for cards like Territorial Hammerskull, Watertrap Weaver, Bishop's Soldier, and Run Aground, they could fulfil the double duty of racing or defending, so you could switch gears if you wanted to. "Sometimes, I can open with Duskborne Skymarcher, Adanto Vanguard, Territorial Hammerskull, and Imperial Aerosaur to pressure and race with my bounce spells. Or, I can just play the defensive game and eventually win the game with Storm Sculptor, Wind Strider, and Overflowing Insight. This deck is more flexible, but had less powerful cards than Red-Green Dinosaurs. Cancel is also quite good in the Sealed actually!" Lee Shi Tian tried to make the best of his entire card pool. Summing it all up, Lee was going into the battlefield with Red-Green Dinosaurs, and he had two decks to swap into depending on what he was up against. Overall, he was happy with his card pool and felt confident about his day. "None of my decks are powerful but at least I have options." If anything ,we have confidence that Lee will be able to outplay his opponents with some extremely transformational side boarding. Midway during Round 9, he became the first player in the hall to cross the 9-0 line! Home-field advantage? After nine rounds of trudging through the untamed wilds of Ixalan, only three explorers survived the ordeal unharmed. They were (14) Lee Shi Tian, Jacob Hart, and Tay Jun Hao, and all three of them were players who had prior Grand Prix Top 8s to their name. Seeing how they knew a thing or two about Ixalan Sealed Deck, let's check in with them and have them share some snippets of their amazing day with us! Lee's story was covered above, so let's meet the remaining two. Hart was an Australian veteran who had been playing Magic for a long, long time. His three Grand Prix Top 8s were from over a decade ago, namely Manila 2006, Sydney 2003, and Melbourne 2002. Since then, he's been preoccupied with his career but still attended Premier Events from time to time. With his 9-0 finish, he is well-poised for a fourth Top 8 tomorrow. His day was not without close shaves. During Round 9, time was called and he only had three turns to win. Thankfully, a timely Waker of the Wilds made a couple of 7/7 lands to seal the deal! "I haven't went undefeated on Day 1 since 2004! It's been a really long time. In all honesty, my deck is pretty solid but it really does not look like a 9-0 deck." Well, we'll let you be the judge of it. Let's check out Hart's deck! 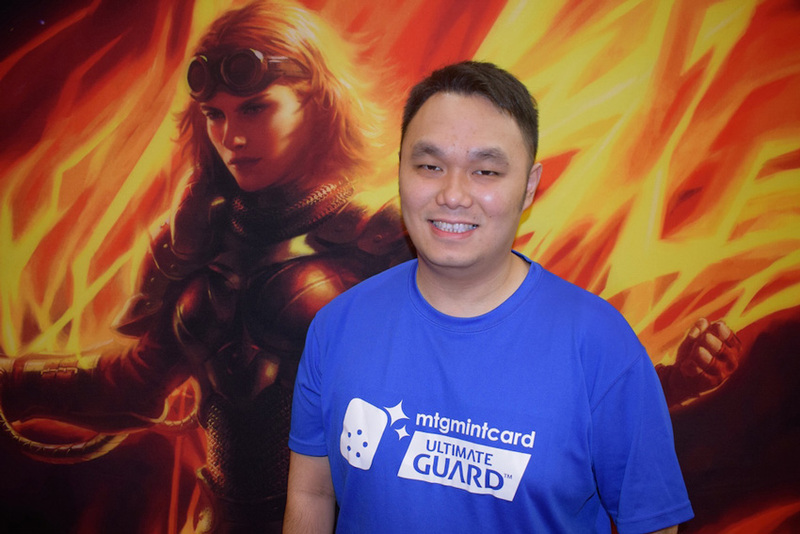 Last but not least, we've got Tay Jun Hao from Singapore, who previously made Top 8 at Grand Prix Singapore 2015. 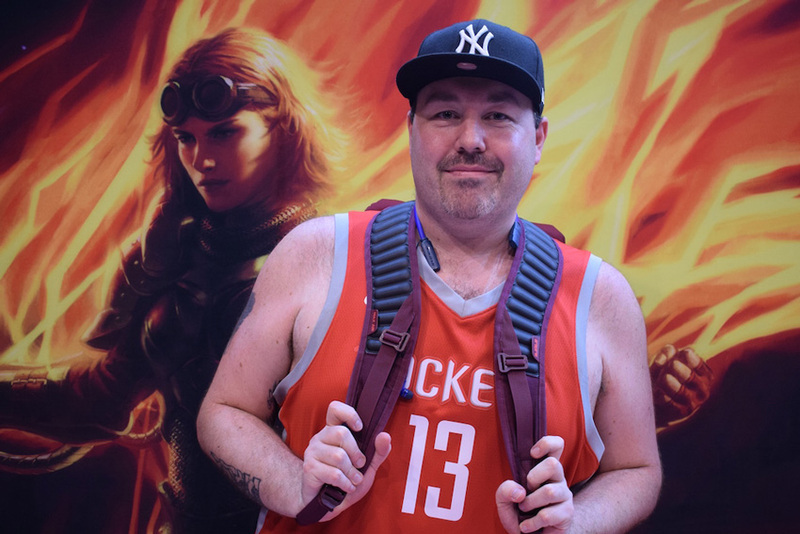 As a proprietor of a local hobby store, he was very much in touch with the community and remained an avid and active Magic player. What were some of the reasons for his success today? Tay shared that he was fortunate not to be forced to play with "too many fillers" and that most of his cards were good. Lightning Strike, Marauding Looter, Repeating Barrage, Daring Saboteur, and Unfriendly Fire were some of the highlights of his Blue-Red deck but he singled out Pirate's Cutlass as his MVP! "I don't have a lot of big creatures so Pirate's Cutlass helped greatly. I also drew very well today and I think Lady Luck was on my side." Could he achieve the required 3-2-1 record tomorrow to make it through to the Top 8?